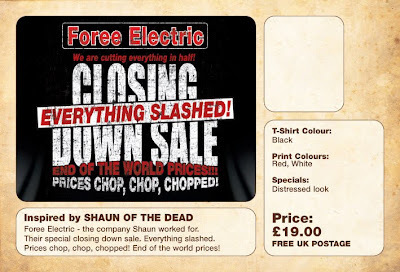 For fan’s of Shaun of the Dead, this super premium t-shirt will be very familiar. Inspired by Shaun’s employer’s (and Ken Foree from the original Dawn of the Dead) Nerdoh have designed this Foree Electric black tee. Advertising their 'End of the World' Sale, 'Prices Cut in Half’ and ‘Everything Slashed’ we think that it ticks every box on the Shaun ‘I Want List’. Printed with a distressed look in red and white on a thick cotton premium t-shirt, it should last and last and look better and better with age!! Grab it at our online store NOW! Brand new to Nerdoh’s range is this super-duper 'Bug Stomper' T-shirt. Inspired by Aliens, this logo is seen on the Sulaco drop-ship in this great film. Cracking looking design and a superb quality black premium t-shirt. 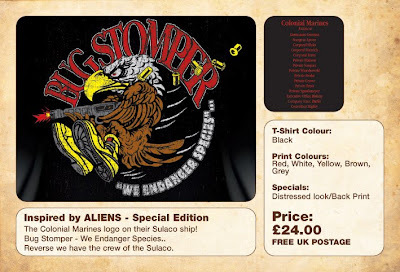 The logo says, 'Bug Stomper' with the Marines motto, 'We Endanger Species...'. This comes in 2 designs...Standard and, above Special Edition (which has the crew of the Sulaco - Marines and Weyland Yutani Employees printed on the back). Available NOW from our online store!! !